An explosion that ripped through Lansdowne in the early hours of Wednesday morning marked the 17thATM to be blown up in the Western Cape this year. Police spokesperson Andre Traut said that “a spate” of ATM bombings have been recorded this year and provincial police departments across the country are working together to combat the crime. 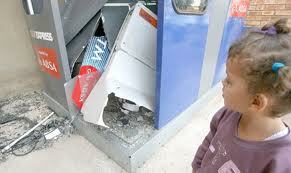 In the latest incident, which occurred at 2.45 am yesterday an ABSA ATM was the target. However, it is not yet known how much money was stolen and no suspects have been arrested in this particular case, however two people have been arrested so far this year in connection with other incidents of ATM bombings. Traut said the bombings in the Western Cape this year had all occurred in the Cape Town Metropole excepting for one in Stellebosch. He said police commissioner General Arno Lamoer had indicated that the police were working with Limpopo,KwaZulu-Natal, Gauteng and Mpumalanga to get to the bottom of the problem. There were also ongoing discussions with the South African Banking Risk Information Centre (Sabric) regarding the bombings. “All these efforts coupled with policing efforts are aimed at finding sustainable ways of dealing the crimes committed,” he said. As for where the bombers were obtaining their explosives, Traut said he did not want to reveal the finer details of police investigations to the public at this stage but there was “reason to believe” criminals were obtaining commercial explosives. FNB spokesman Steve Higgins said they were concerned about the bombings because of their violent nature which could affect innocent people. Without giving a figure, he said “a handful” of such incidents had occurred in the Western Cape. He said ATM machines were usually loaded with between R200 000 and R300 000 resulting bombings incurring significant losses. Higgins said FNB had a policy that bombed ATMs would not be replaced but rather a new site for an ATM would be identified. In the past year, the bank had also started installing devices to keep the money secure in an inner vault should the ATM be blown up.